Marble is a derivative of limestone. It is a metamorphic stone that can be polished. Marble is characteristically soft and easily scratched or etched by acids and should be considered cautiously in most rooms. 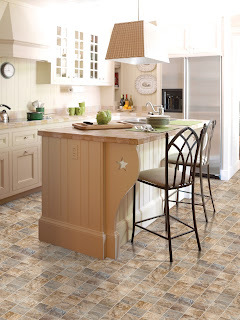 Porcelain or ceramic mosaic tiles are two inches square or smaller. They can be installed individually or can be found pre-mounted on mesh or paper sheets. Mosaics may be glazed or unglazed. Stone or marble chips embedded in cement make up a terrazzo floor. The polished surface makes a durable floor material. Just as the name implies, natural stone tile is made entirely of natural stone mined from the earth. When you walk across a granite, marble, travertine, limestone or slate floor you are walking across one of our most valuable natural resources. Metal tiles are becoming a popular way for people to create a distinctly different look and feel in their home. They come in various styles, molds, and colors and make excellent accents or primary centerpieces in any environment. Metal tiles range from copper to stainless steel, patina to bronze and zinc. It is important to know your options when looking to buy metal tiles. Overwhelmed by your options? Don't be. Visit the Kermans Indianapolis tile showroom to get a hands-on feel for each tile style. While you are there, our flooring design consultants can talk to you about your specific needs and make recommendations.